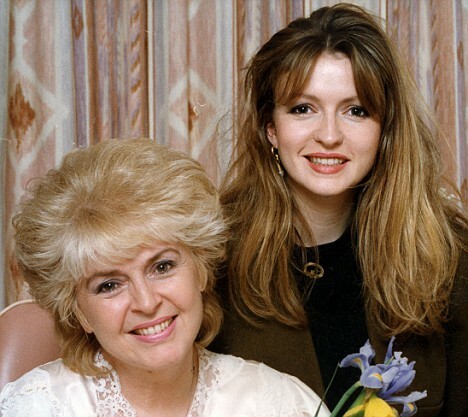 Several years after the tragic death of her daughter Caron Keating, TV and Radio presenter Gloria Hunniford says she has found a way to deal with her grief by her strong belief in angels. The popular Northern Irish TV host, 71 , has found comfort in what she believes to be ' angel messages' from her late daughter. She's said in recent times that she regularly encounters lone feathers, which she believes are a sign from her daughter Caron in Heaven. Gloria said: 'Caron believed feathers were calling cards from angels. 'It's extraordinary because I am constantly finding isolated fathers, and even in the radio studio where I work - even though there were no other feathers around. Caron Keating died at her mother’s home in Kent at the age of 41 in April 2004 after years of battling breast cancer. She left behind her husband Russ Lindsay and two sons Charlie and Gabriel. Lindsay has since remarried. Following her death, Ms Hunniford has helped raised money for cancer and carer charities, including setting up The Caron Keating Foundation, which aims to financially support family members caring for a sick relative and give emotional support to families and sufferers of cancer. A year after Keating's death, Hunniford published a book 'Next To You: Caron's Courage Remembered by Her Mother'. This was followed up by a second book, a guide for the bereaved, entitled 'Always With You'. In an interview with The Times, MS Hunniford said: 'Grief, when you lose a child, consumes you. It is simply the worst kind of loss. 'In the immediate aftermath, it is easy to believe the pain might kill you. It is a completely holistic agony. You can think of nothing else. You just go into that frozen cube. Somehow you function, but you don't know how. 'I thought I would never laugh or smile again, and it surprised me when I did. It is like scratching and clawing your way out of a black hole.